farnovision: The Real Tragedy of "The Farnsworth Invention"
In July 1993, a young playwright and screenwriter named Aaron Sorkin flew from Los Angeles to spend the better part of a day with an elderly widow in Salt Lake City, Utah. At the time, Sorkin was a rising star in the Hollywood firmament. The film version of his successful broadway play A Few Good Men -- the military/courtroom drama made famous in part by Jack Nicholson barking at Tom Cruise that "You can't handle the truth!" -- had cemented Sorkin's standing among the 'A-List' of Hollywood writers. Over the course of the ensuing decade, Sorkin would become famous for writing the feature film The American President, and then go on to create the critically acclaimed television comedy Sports Night and the venerable The West Wing, one of the most successful dramas in the history of television. In Salt Lake on that summer day, Sorkin was introduced to Elma G. "Pem" Farnsworth. Conducting the introductions were Fred Zollo and Nick Paleologos, two film producers who had acquired the screen rights to Mrs. Farnsworth's book Distant Vision -- a biography of her late husband, Philo T. Farnsworth, the inventor of electronic television. Mrs. Farnsworth's mission, at the producers' behest, was to regale Mr. Sorkin with her stories from the invisible frontier where she and her husband had traveled -- and to sell Sorkin on the idea of turning her book into a screenplay for Castle Rock, the studio which had produced A Few Good Men and had taken an option with Zollo and Palelogos for Mrs. Farnsworth's book. Aaron got non-stop jewels. We went to a cafe for lunch and more stories flowed. As the hour of Aaron's departure grew close, we all agreed, emphatically, that this story distinguished itself and was unique because it actually happened the way Pem recalled -- and that was the best way to tell the story because IT HAPPENED THAT WAY. Everyone spent several minutes restating the point, and everybody -- including Aaron -- was in harmony in this regard. And yet, when that conversation finally came to bear fruit more than a decade later, one of the most oft-cited issues taken with the resulting work is that in essential -- indeed pivotal -- details, the work does not portray events the way they "actually happened." Fast forward to 2004, when Aaron Sorkin announced his departure from The West Wing, and shortly thereafter that his first new project would be a screenplay about Philo T. Farnsworth. The screenplay was written and sold to New Line Cinema for some number of millions of dollars, but the production never got off the ground; in 2006 Sorkin decided to rework the material as a stage play instead. The play opened to mixed reviews on Broadway during the strike-shortened season of 2007, and closed just a few months later. Most of the reviews that found fault with The Farnsworth Invention took the play to task for its failings as entertainment: the lack of character development or the reliance on long expository passages, all combining to make it difficult for audiences to connect with its story and its protagonists. But there was another common thread to the criticism as well - namely, the playwright's extensive reworking of some of the most central details of the actual history that inspires the drama. The problem with The Farnsworth Invention is fact. Playwright Aaron Sorkin's take on the gargantuan, and real, patent battle between the visionary chief of RCA, David Sarnoff, and the boy wonder Philo T. Farnsworth is a great tale. But here, it's a tale... A play that tells us, from the memories of its characters, that a big corporation trampled the little guy - when in fact, the little guy ultimately won in court - may excel artistically, even as it misleads us about our own history. 'I'm sorry to report all this - I had a great time at the theater. Afterward, I thought about the way The Farnsworth Invention manipulated the facts and, in the end, its audience. I felt defrauded. Apparently, Sorkin pretty much destroys the historical record, especially in terms of key patent decisions. As a Sorkin fan, I really want to see the show; as a historian, I'm queasy that he's reportedly playing so fast and loose with the facts. I have no problem with "historical fiction" as a genre, but I do think creative artists bear some responsibility to keep the major details correct. Fast forward again, to the spring of the year 2010. Despite the brevity of its Broadway run, The Farnsworth Invention -- and its reversal of key events that "actually happened" -- lives on, most recently at the Timeline Theater in Chicago. Ironically, Timeline Theater is an institution with a mission to present "stories inspired by history that connect with today's social and political causes." It's hard to fathom how an audience is supposed to "connect with today's social and political causes" while watching a drama that gets is pivotal historical facts wrong, no matter how witty, erudite, or entertaining the writing may be. In this case, it appears the theater is less inspired by history than by the presence of a famous Hollywood writer, for it seems they have gone out of their way to make excuses for the playwright's rewriting of history itself. Indeed, the authorities at Timeline Theater -- like other producers before them -- are well aware of the liberties the playwright has taken with actual events. And like the prior productions, Timeline Theater has had to go to some length to make excuses for the play's historical liberties. Back in New York, when the producers of the Broadway show got wind of the historical objections, they issued a statement disavowing any fealty to actual history, stating that Sorkin's play "is presented as a memory play from the minds of the two most interesting, yet least objective sources. These characters acknowledge their own unreliability throughout the course of the play." So we're not supposed to believe anything we see or hear from the stage? Apparently not, because Timeline Theater felt compelled to issue a 28-page "study guide" with circles and arrows and paragraphs that attempt to make up for the play's myriad historical shortcomings. I appreciate the theater's effort to compile such an extensive resource, at the same time I wonder how much of it would really be necessary if the play itself was a tad more reliable on some of the major story points. There are many details that are changed or streamlined in the play, plus characters who are invented or condensed from real people. The major difference between the play and the history is the outcome of the patent lawsuit. The lawsuit did take a long time and RCA certainly benefited from lengthy legal proceedings, but Farnsworth did win in the end. Until his patents ran out, RCA paid licensing fees to Farnsworth. However, because of the lawsuit, and time lost during World War II building radar equipment rather than televisions, Farnsworth was only able to reap the financial benefits of his labor for a few years before the major television patents expired. Excuse me, but we're not just talking about "details" nor is anybody taking issue with the need to "streamline" a long narrative in order fit it into screen or stage time. We take issue with the reversal of an undeniable verdict of history. Let's be clear about one thing: if the litigation had turned out the way it is portrayed in this play, there would be no reason for the play to exist. The fact is Farnsworth won the litigation. His patents were validated time and again. That's the whole reason why his story remains important. The verdict this play renders invalidates the whole two hours that precede it. Like the man said: it's a fraud. Consequently, despite the agreement at the moment of inception back in 1993 that the way to tell this story is the way it "actually happened," every production of this play has had to defend itself from the playwright's failure to do just that. Where is the obligation to entertain within the constraint of the way things "actually happened"? I mean, George III of England did NOT win the War of American Independence; Jefferson Davis did NOT win the Civil War (and yes, Lincoln was assassinated shortly thereafter...); Hitler did NOT win World War II. And RCA did NOT prevail in its patent litigation with Philo T. Farnsworth. So why are we subjected to a play that says otherwise? It would be one thing if The Farnsworth Invention were presented as an exercise in obvious fiction - the way Quentin Tarrantino re-imagined World War II, perhaps. But this work presents itself -- as the Timeline Theater mission states -- as having been "inspired by history." How can you be inspired by history and defile it at the same time? My first, if not only, obligation is to entertain. A news organization has a much different responsibility. I might not be telling you the whole story. I might not be telling you a story in a manner that is properly sophisticated. I would hate for anyone to limit the scope of their education on a subject to me. And frankly, every teacher I've ever had in my life would agree with what I've just said. One really has to marvel at the arrogance that goes into such a statement. No doubt, the first obligation of the dramatist is to entertain. But if a writer is going to create stories out of whole cloth, then let him write pure fiction. At the point where he choses to draw on historically demonstrable facts, has he no obligation to present those facts as they were recorded? When the verdict is "not guilty," how on earth does the cause of "entertainment" entitle anybody to reverse that verdict to "guilty" and say that it is just "entertainment." What would Senator Moynihan say if he new that the sanctity of "facts" could be so readily dismissed for the sake of "entertainment"? What I don't get is why the facts can't be construed as entertaining, especially when you are dealing with a case where "the truth is stranger than fiction." The HBO mini-series John Adams was mighty damned entertaining and did not have to rely on any major story-point reversals to keep its audience amused. Why not The Farnsworth Invention? Ms. Maren's post is a puzzlement. To justify the dramatic device of reversing an historical verdict, she cites the example of the Michael Frayn's play Copenhagen, which "goes through three different imagined versions of a conversation between Niels Bohr and Werner Heisenberg that was known to have taken place but not recorded..." Well, fine, nobody was there with a recorder, so we don't know what the two principals actually said to each other. So a case can be made that its is useful to speculate -- Roshomon-like -- on a number of possibilities as to what might have transpired. But in the case of the verdict in the patent litigation between RCA and Philo Farnsworth, we know exactly what the verdict was. In the 1934/35 interference # 64,027, "...priority of invention is awarded to... Farnsworth." So how do we wind up with a play in which the priority of invention is awarded to RCA? How can we wind up with this demonstrably false climax from a playwright who acknowledged from the very start that the power in this story derives from the way it "actually happened" ? 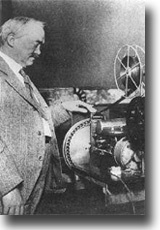 ...Sarnoff’s continued presence in the television industry contributed to the lack of recognition Farnsworth received for his invention. That would be a much more complicated story to tell in a two-hour play. And, I sympathize with the sentiment that the Farnsworth character expresses in the penultimate scene, that fictionalized encounter with Sarnoff when he says (after the false verdict is rendered), that "I just lost television." That is indeed arguable in the long view of history and the fact that most people who see this play will never have heard of Philo T. Farnsworth (or David Sarnoff, for that matter). There are numerous reasons why the public generally has no knowledge of a man whose genius is re-awkened in our living rooms every time we turn on a TeeVee. But therein lies the real tragedy of The Farnsworth Invention -- that the audience, after sitting through two hours of elaborate exposition and explanation, is deprived of any meaningful insight into the true character of the man who, as the poet Max Crosley wrote, "breathed life into all our living room dreams." Much of this is difficult for me to write, because I really hold no personal animus for Aaron Sorkin. I mean it when I say that I could not have made it through the Bush years without a weekly dose of The West Wing to remind me how this country is supposed to work. But I also have some reverence for this man whose singular contribution has altered civilization in ways that we are still discovering. More to the point, I believe strongly that those contributions emerge in part from Farnsworth's unique character -- a that character is clearly NOT portrayed in this drama. 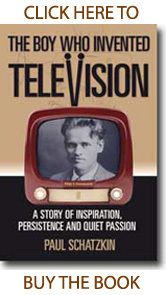 I was privileged in mid-the 1970s to spend a considerable amount of time with Philo T. Farnsworth III, the eldest son of the man who invented television (who died in 1971). And from "P3" I learned to appreciate what it meant to "stand up" on the invisible wave of advancing technology and to ride that wave all the way into the shore as he did over the course of a decade. 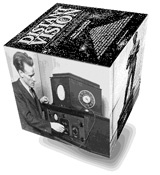 While the great minds of science, financed by the biggest companies in the world, wrestled with 19th century answers to a 20th century problem, Philo T. Farnsworth, age 14, dreamed of trapping light in an empty jar and transmitting it, one line at a time, on a magnetically deflected beam of electrons. But The Farnsworth Invention would have you believe that was the only inspiration that ever occurred to Philo Farnsworth, after which he was at a complete loss as to how to make anything meaningful out of his invention. There is even a scene in the play where the seemingly hapless inventor turns to a movie-star visitor to his laboratory and begs her if she knows the solution to his "light problem." Never mind the fact that RCA spent millions to "get around" Farnsworth's patents and finally had to accept a license or the use of those patents -- a first for a company that was more accustomed to crushing its opposition and simply appropriating whatever technology it found useful. The bigger point that this play neglects is that the initial inspiration paved the way to a portfolio of more than 150 patents, all of which were instrumental in bringing television to the marketplace. And when the playwright or the dramaturg argues that Farnsworth's patents expired shortly after World War II, they also miss the point that Farnsworth's genius delivered a broad portfolio of inventions year after year after year, the value of which extended well into the 1950s. The tragedy of this play is that this prodigious character is completely ignored in what is the first and quite possibly the last popular entertainment that will ever be rendered out of this story. That guy invents a completely new system, using completely new technology not yet out of its short pants, and brings it in over the course of one year. This was unlikely. 'Twas a miracle. This required a clear, and sober man. It is silly to think a drunk could accomplish this. PTF was stoned on the adventure of a lifetime. Pem recalls visiting a speakeasy and that it was exciting to her, but their house in Berkeley was walking distance from a theater, and that was their favorite nightime escape. And dancing, of course. Only someone like this is capable of successfully gathering up technology and apparatus and making it all work in a year. Being able to master all he set out to do, successfully, with such confidence, builds a hefty self image. He loved life and what he had become over the years, and that is someone who needed no booze in order to live in his own skin. 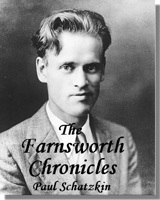 There is really only a hint here of the character that I have come to appreciate over the years, the Philo T. Farnsworth who harnessed quantum forces in a way that no man before him had, and delivered a breakthrough of truly epic proportions. His is a story of the ages, the essence of which remains largely untold and unknown. 6. Setting the Record Straight? The Farnsworth family held Aaron Sorkin in great esteem. With his gift for character and dialog -- and, yes, convoluted detail -- there was great hope that the corporate, PR-generated slights of the past 80 years would finally be corrected, that the record was finally going to be set straight. And therein lies the ultimate tragedy of The Farnsworth Invention: If Aaron Sorkin cannot do justice this story -- "as it actually happened" -- then who can? I suspect TV is the one great invention whose history can't be told both faithfully and inspiringly. Much of it is boring incremental advances in technology. Much is lost trade secrets and experiments no one gave a damn about at the time. And there is a whole chapter - the mechanical scanning era, pre Farnsworth - that is totally irrelevant to what came before OR what came after, either in media terms or technical terms. For itself, it is fascinating, but it is a hiccup in the greater story - a distraction. There is magic in the birth of TV, but it is the magic one experiences seeing something far away, as it happens. That wonderment, that mysticism, is going to be near-impossible to recreate for an audience so visually instinctive as ours today. What has been seen can never be "unseen." "Much of it is boring incremental advances in technology." That may be true with television as it is probably true for almost any technology. But the whole point to the Farnsworth story is that there WAS ONE inflection point, at which, as you say, everything that came before became totally irrelevant, and everything that came after became possible. 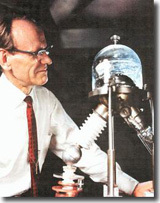 Others (like Boris Rosing and A.A. Campbell-Swinton) had postulated the possibility of cathode-ray scanning, but Farnsworth was the first to demonstrate the ability to focus and steer electrons. Having the right idea is one thing, but having the right idea AND ACTUALLY MAKING IT WORK is EVERYTHING. Farnsworth's contribution was a breakthrough of epic proportions, and that is the fact that keeps getting glossed over in everything from encyclopedias to Aaron Sorkin's play. But I agree, it's a mystical achievement this is hard to convey to a contemporary audience. I just that make it through the Bush years, without a weekly dose of the west wing reminds me of how this country should work. The business loans suppose to be important for people, which want to organize their career. As a fact, this is not very hard to get a collateral loan. When you are in not good state and have got no money to go out from that point, you will require to receive the home loans. Because that will help you unquestionably. I get collateral loan every year and feel OK because of it. I must say, he was truly an inspirational guy. Farnsworth was such an awesome device. Loved it.